The sleeves are in, and they seem to fit fine. Above is a photo taken half way through the process of setting the sleeves on the new muslin, which I like because it shows not only that those pesky drag lines in the sleeve are gone but also how the princess seam lines aren’t trued in the pattern. See that little triangle sticking out of the shoulder seam on the left? Yeah, that’s what I’ve been having trouble with these past few weeks. On the right I just sewed the sleeve in as if it weren’t there. Here’s a close up of the back sleeve seam shown inside out so you can see how the seam lines veer away from each other. Disregarding that extra triangle means you lose the positioning of the sleeve notches. The same is also true for the front. But, I now know the sleeves can be set in by simply disregarding that extra triangle. All is still not perfect. Though the sleeves are set in without weird puckers near the double notches, a bit of the bagginess under the arm is back. Perhaps my shoulder pads need to be a little thicker? Also, the sleeve darts are now too low, so I need to remove a half an inch from their length (which was lengthened an inch and a half in this muslin). Though, I guess a thicker shoulder pad might make a difference there, too. I also am not sure about the length of the jacket itself. I kind of like the length of it unhemmed. If I can squeeze it out of the fabric, I may add an inch to the bottom to compensate for the hem. 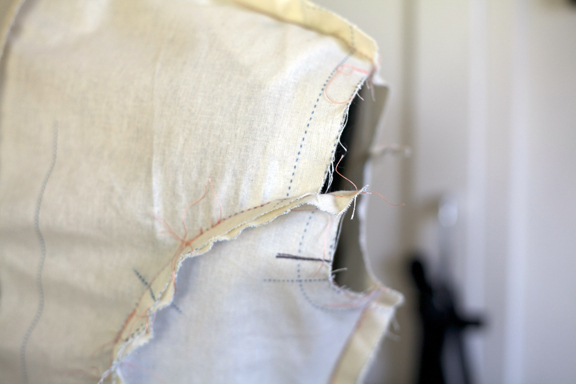 Next up: make the same changes in the lining and check how the lining fits by walking all of the seams. Hopefully I’ll be cutting my fabric and getting back to the videos pretty soon! Previous Post My Lucky Month! you’re doing a great job! I wonder why/what happened to cause those little triangles from sticking out. HMMMmmm.. you have me baffled. Keep up the good work! Oof! Looks like you’ve come up with some good solutions for the pattern’s issues. 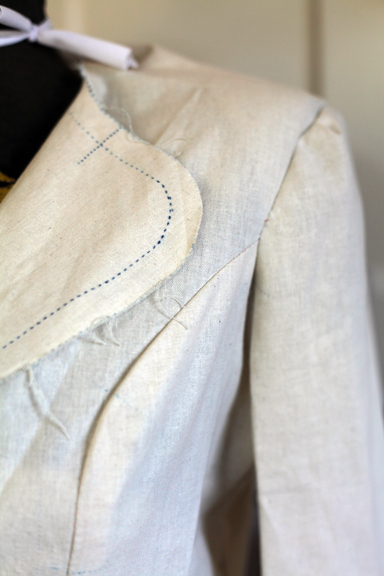 Your jacket is looking great, albeit that it’s a muslin – love your work. Wow its looking good. I am about to embark of my first jacket project but I am thinking I should have done this course first being a beginner and all! Look forward to seeing the finished jacket. Your patience with this is amazing! Good luck with the rest of the fitting and sewing! I am sure it will be worth it in the end. I’m looking forward to seeing how it comes out. It looks like there should be some extra ease in the side panels – the center panel is poofing a bit around the top of the curve – and I think you do need that extra bit that is sticking out. Try pinning the princess seam together from the bottom up about half way up and then from the armhole (matching the top of the seam properly) back down around the curve. I try to sew all seams from the bottom up, but for extra curvy ones like this, I will often go from the top down at least around the curve and then from the bottom up to overlap the first stiching. Also, when you’re sewing 2 curves together try to always stich with the wider curve on top and the part that needs to ease underneath (like body on top, sleeve under). The feed dogs grab the fuller fabric and slows it down, while the foot presses the top fabric through a little faster – gives just the teensiest bit of differencial and makes the whole process easier. It’s looking really great on you! Thanks! In my original muslin I tried what you suggested in the first paragraph, matching all of the seams, the notches, and then carefully pinning and easing everything between. 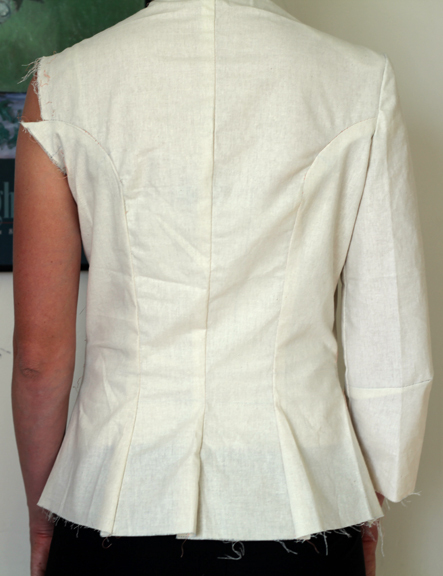 No matter what I did, I couldn’t get the sleeves to set in nicely around the double notches in the back. Perhaps this time around I overcompensated and should have eased in a bit more along the upper curve? 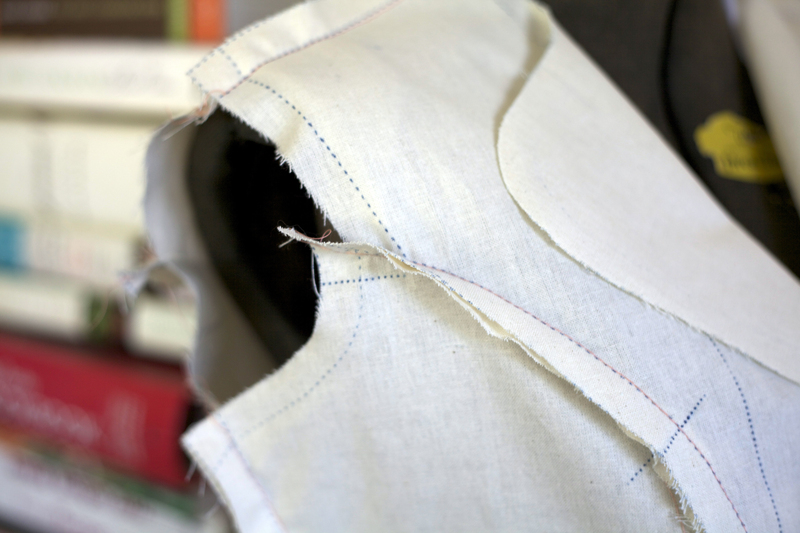 It can’t hurt to rip that top portion out and try again with the two fabrics together the way you suggested. I’ll let you know how it goes! Also, I definitely have “get thicker shoulder pads” on my list of things to do. Then ones I have are pretty puny! I have heard from several sources that this pattern draft is a disaster. It’s not you honey, It’s the pattern. I’m starting to feel the same way. I actually cut out the muslin for Vogue V8333 last night. I figured it couldn’t hurt to try out the fit of another pattern. This particular pattern looks similar to the Starlet Jacket, it’s hopefully been vetted by Vogue, and it allows me to compare the couture instructions with the class videos for double the lessons! I had wanted to continue my “Tuesdays with Gertie” series through the year with her book, but I’m hesitant now. I will likely wait until I hear how others enjoy the patterns and information in the book first. Amy, I was thinking something similar to Robin’s suggestion. From the back it looks like quite a bit of length from the center panels eased into the side panels, which is why you see that rippling around the curve. If you took those apart and re-sewed the panels with the back on top, side panels on bottom, the side panels might ease in better. 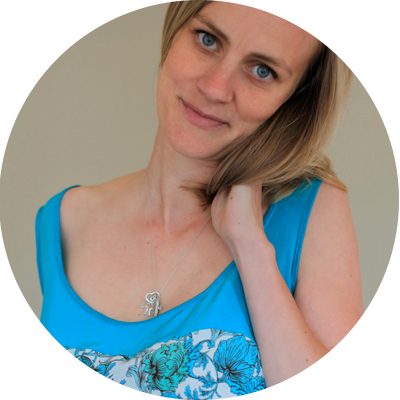 (I don’t know if you did that already, and there still might be extra length left over, but just a thought in case you feel like persevering…) Of course that won’t solve the sleeve ease craziness. I find over an inch of ease is hard. Two inches is asking for my insanity! (And I have a feeling this might have that much…) It might help to shave off some from the back sleeve head, flattening it a bit. Totally unscientific, but that’s what I did to both my Lady Grey and Marfy jackets and it helped. I tried restitching that seam last night, and I was able to work a little of the side back into the back, but I didn’t push it all for fear of those sleeve puckers I had in the first muslin. Even so, those pesky puckers came back. In frustration I cut out a muslin for Vogue V8333. I just wanted to see if another pattern would help with these issues. If I return to this pattern, I’ll try your suggestions to continue playing with that seam and try altering the back sleeve head. I’m learning a lot with this pattern, but I’m at the point where I either need a good fitting book or a good fitting teacher. I can’t intuit my way through it anymore.